Ali was trained to be a petroleum engineer, but born to be an explorer. He left Kuwait at the age of 17 and have been exploring this planet ever since. He’s now sharing that experience with you. Ali lived in many different parts of the world, mainly around salty water and rugged majestic mountains. Along the way, he spent 11 years working in the energy exploration business in Alaska and the Arctic before coming back to the Arabian Peninsula to explore the untouched surface and the rich subsurface. Ali started his career in the oil industry working for bp exploration in Alaska and the Arctic. He progressed around the world working ion Oman, off shore Abu Dhabi and Kuwait. In 2013, he left the oil industry and his job as the Petroleum Engineering Manager for the world 5th largest oil field to focus on Husaak Adventures in 2013. Khalid met Ali on one of the very first husaak trips in Oman, and he's been coming back ever since. A film and TV commercial producer by profession, Khalid's background has taken him from the world of finance through to advertising, with a stops in software development along the way. Expeditions to find new and exciting destinations is what Khalid enjoys the most, especially when there's rope or rock climbing involved in getting there. "Being part of this concept and seeing the very real impact it's having on people's lives has been such a gratifying experience for me"
A member of the Executive Committee and the group's Media Director, Khalid feels most at home hanging off the side of a cave wall, camera in hand, waiting for that perfect shot. Saleh is an entrepreneur and an explorer by heart. Saleh and Ali have been camping together since they were children. Since 2008, Saleh has been Ali’s partner in exploring such amazing places as Alaska, Mongolia, Jordan and Southern Arabia. These trips have formed the basis of the existing Husaak expeditions. Saleh is currently part of the Executive Team and the General Manager of all Oman operations. Saleh brings leadership and discipline to the team. He will be working toward growing and expanding the Oman expeditions to serve more thirsty explorers and adventurers. Hasan Al Hashmi was born and raised in Abu Dhabi, a petroleum engineer by profession an outdoor & offroad enthusiast by passion. His love for the outdoors started in the middle of UAE's desert where offroading & desert crossing became his sanctuary to escape the city life, enjoy the company of like minded people while boiling a Karak tea pot. 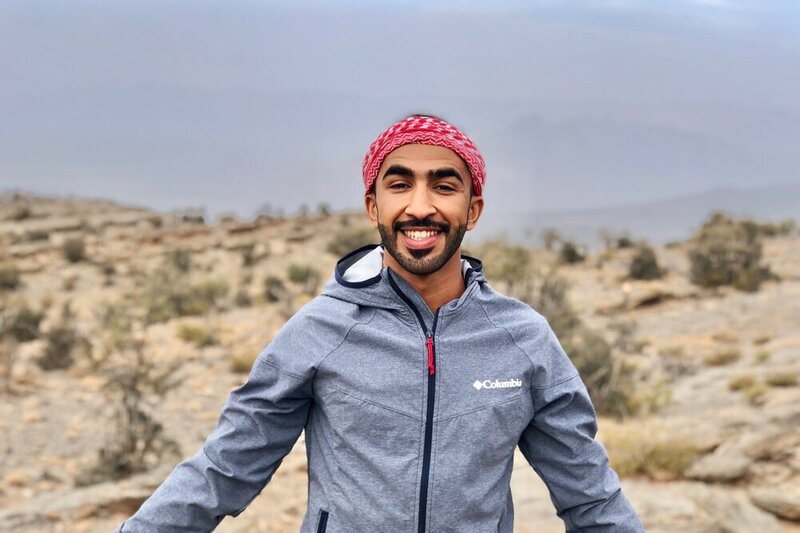 Combining his love for outdoor physical activities and his passion for geoscience, Khalfan couldn’t be happier to join Husaak Team. Khalfan holds a Bachelor degree in Petroleum Geoscience Engineering and a Master’s degree in Business Administration. His other eye (the one not looking out for Oil prices) is often on Husaak trips announcements for exploring the world. Setting up camp miles from anywhere is his best kind of adventure. To him, it is all about experiencing something new, challenging yourself, learning and broadening your perspective. Ahmed, aka 3ammadi was born and raised in Bahrain where his backyard was the desert plains and the Arabian Gulf. In 2015, he found his new love of mountains and the campfire life when he joined his first trip with Husaak; and he’s been hooked ever since. This aeronautical engineer who works in investments, seeks the great outdoors as a retreat from daily life stress. I am working toward getting a Masters degree in Sports Business from the Johan Cruyff Institute. A full time employee with Husaak since December 2017 (Center Manager, Operational Manager). Working in a busy and heavy loaded Husaak environment allowed me to grow in handling responsibilities, growing my social network especially in the gulf region, and enjoying a healthy interactive lifestyle. After a life changing hike that lasted 11 hours under the full moon, Wafiya was awakened by the wonders of nature and the power of the mountains. Ever Since, she found her peace and happiness hiking mountains and sleeping under the stars. "It feels like home." The enthusiastic Kuwaiti/Japanese is polishing her skills in ninjitsu, pursuing her graduate studies in environmental sciences and is a researcher in EPA. She is also the team admin, managing trip announcements and registration. If you are wondering who is talking you into signing up in trips, it's her. Haya, born to be wild. She's a sucker for adventure. She spends her life running the streets, hiking and climbing the mountains, surfing and diving the oceans, and if she's not doing any of that it's because she's in the office. She has a bachelor’s degree in business administration and master’s degree in systems engineering and right now working in the petroleum field for Saudi Aramco. She enjoys sharing her love for the outdoors with others and Husaak is her favorite place to do that. Haya is currently traveling the world, hosting a travel show on MBC called @wainalheen. I started to train on the ropes in 2008 first in Salalah, after that I moved to cape town stayed there for two years and a half to continue on studying about the ropes and rescue, and I fell in love with it, and I’m proud to say that i was the first man in the gulf to have the IRATA international rope access license, now I have an 12 years experience in ropes and rescue, and working in Salalah port. I love the outdoors, hiking and everything that would include playing with ropes, and the good thing about being part of this is the teamwork and helping other people. Born in 1993, half Kuwaiti/Filipino, a holder of a Bachelor’s degree in Mass Media and Communications, foodie, fitness junkie, and a very curious traveler - Hey all, Sherin here! I grew up in an environment where I was always encouraged to be in the outdoors. This love, with a side of curiosity soon grew over the years as I got more introduced to our wild, wild world. It wasn’t long after my studies where I realized that the corporate world was just not for me. I love to travel and there was something enticing to me about living “the simple life.” These experiences have definitely led to me to where I am today- Husaak. Being a full-time guide constantly challenges my abilities to build up on my strengths and weaknesses- physically, mentally and socially. I even discovered more skills I never thought I had or will ever have. It’s endless! I went from a normal city traveler to a person who can’t live away from the outdoors. It all started when I joined Husaak for my first outdoors experience back in January 2016. I used to live in Boston from 2013 to 2018 where the temperature can reach -30c during winter time. Coming from that harsh cold environment, I appreciated Arabia and its nature even more. I like the beauty of outdoors and camping because I can pretty much decide what I want to do; be it the bonfire and tents in the desert, a hike in the mountains, a trip to a massive cave or a spectacular beach view. Besides the love of outdoors I am obsessed with food, I am super innovative with the dishes I cook with very limited resources. I have a bachelors degree in Economics and a high diploma in Event Management. Faisal Al Dossary Aka the Runner was born in Saudi Arabia but spent half of his life living in different countries form the west to the east. By profession a chemical engineer working for Saudi Aramco and by passion a runner who loves the outdoors. His love for the outdoors started in the mountains and valleys of japan where he got his bachelor’s degree. His passion to the outdoors grew significantly on his first trip to Jabel shams in 2016 where it broke him physically but uplifted him mentally as he stood on that summit and felt the connection with the rest of world. 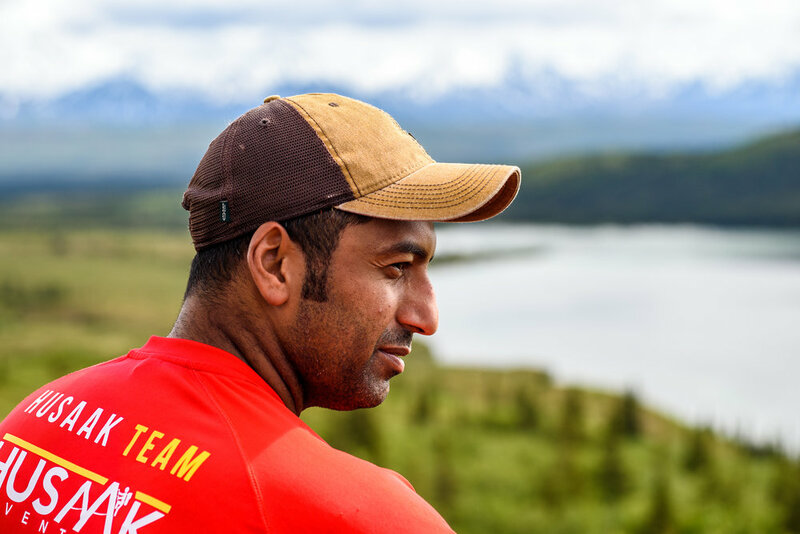 Faisal’s dream is to reach the 7 summits and to inspire others to seek their goals. To him, it is all about opportunities and the need to catch them, by physically and mentally challenging yourself and saying goodbye to your comfort zone.